It has been said, "Those who don't learn from history are doomed to repeat it." In an effort to test this axiom each week I'll post a little story from the history of the Christian church and hopefully we'll all learn something. If not, then at the very least we'll have some fun telling the church's story - one week at a time. One of my favorite movies over the last few years is Gladiator with Russel Crowe. For those unfamiliar with it, it is the story of a Roman General who finds himself stripped of his rank, his family murdered, sold into slavery as a gladiator in the games all because he stands in opposition to a cruel and unworthy emperor. It calls to mind another member of Rome's military, this one a centurion, who also took a stand against his emperor; and the integrity of a very uncommon man who stood with him. We're not sure when he was born, but there is good reason to believe that Marcellus was born in Arzas in the province of Galicia in what is now northern Spain. Hoping to gain a large fortune and Roman citizenship, he entered into the military life. He proved able at his chosen career, rising in the ranks to centurion (officer over a hundred men), serving as a captain in the legion of Trajan. He married a young woman named Nona and she bore him twelve children. His rank and income would have allowed him to own a small farm which would have sustained his family while he was off on a campaign - of which there were many. It was on one such campaign in North Africa that the birthday of Emperor Maximian Herculeus came about in the year 298. It was the tradition in those days for members of the military to celebrate the emperor's birthday with extraordinary feasting and solemn religious rites that included the offering of sacrifices to various gods, particularly those deemed to be favorites of the emperor himself. This left Marcellus with a decision to make, because a few months earlier he had heard the preaching of a holy bishop from the church of Leon, the region of Mauritania (Spain) where his wife was from and where his family now lived. His heart was stirred and his entire family had converted to Christianity. The teachings of the church, of course, led him to the belief that the emperor was no god, or even a friend of the gods, but rather a mere man. He could not bring himself to enter into the celebrations as he once did. Neither could he stay silent. Without warning, he stood and in front of all his men, he removed his military Phalerae (belt of honors) and threw it down. "I serve Jesus Christ the Eternal King," he is reported to have said loudly. He then threw down his vine-switch, a short length of polished vine branch, that was the symbol of his authority over his troops, sort of a poor man's scepter. "Henceforward I cease to serve your Emperors, and I scorn to worship your gods of wood and stone, which are deaf and dumb idols. If such be the terms of service that men are forced to offer sacrifice to gods and Emperors, behold I cast away my vine-switch and phalerae, I renounce the standards, and refuse to serve." The words struck those listening like a fist. To their ears Marcellus had committed treason, insubordination, treachery and blasphemy. There was no greater insult than to cast down the emblems of his rank and command. (The Phalerae with its medallions depicting the emperor and his heirs is pictured in a period costume at right. The vine-switch is in the actor's left hand.) They seized their now 'former' commander and brought him before the local governor Anastasius Fortunatus. He was ordered thrown into prison until the celebrations were complete. When that time came Marcellus was brought before the governor again. "What did you mean by removing your military gear in violation of military discipline and throwing away your phalerae and vine-switch?" Marcellus did not hesitate in his reply, "...I made answer openly and in a loud voice that I was a Christian and that I could not serve under this allegiance, but only under the allegiance of Jesus Christ the Son of God the Father Almighty." Roman law did not allow Fortunatus the option of ignoring the insubordinate conduct. He was required to report the matter to higher authorities. The judge had hoped to lay his case before Maximian and Constantius, the latter of which was known to be friendly toward Christians. However, Marcellus was taken to the deputy Praetorian prefect Aurelius Agricolan instead. When Agricolan had heard the evidence he asked, "What madness possessed you to cast away the signs of your allegiance, and to speak as you did?" Marcellus answered, "There is no madness in those who fear the Lord." After more arguments and a series of threats that seeming fell on Marcellus' deaf ears, Agricolan dictated this verdict: "Marcellus, who held the rank of centurion of the first class, having admitted that he has degraded himself by openly throwing off his allegiance, and having besides put on record, as appears in the official report of the governor, other insane expressions, it is our pleasure that he be put to death by the sword." You may wonder how it is we know the details of his testimony? Well, even back then there were court stenographers whose job it was to record all that was said, so it could be proven to the families of the condemned that everything was on the up and up. According to an appendix attached to Marcellus' court records, the stenographer at his trial was a man by the name of Cassian. I know, given the title of this article you were hoping for something a little juicier - shame on you. Don't bail on me though; this is where it gets interesting! You see, to Cassian the verdict seemed criminally unfair. So much so that he threw down his pen, and with an exclamation apparently not suitable to be included in the records, refused to write another word. Agricolan ordered him thrown into prison, too. Marcellus' sentence was carried out later that day, October 30, 298. Cassian was held until he could face his own trial. 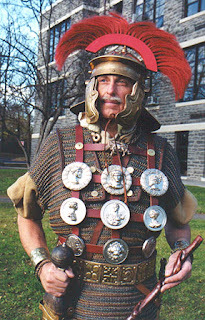 The Christian centurion's children followed their father's example; all lost their lives for the defense of the Gospel. Three of the boys were hanged and then decapitated at Leon. Their mother bought back their bodies for money and buried them secretly; they were later transferred to a church built in their honor in the city of Leon. As for Cassian, his trial came about a month later. He refused to recant his criticism of Marcellus' sentence and openly declared that he too was a Christian. He was also sentenced to death, and was beheaded for his faith on December 3, 298 - 1,709 years ago this week. December 4, 1093: Anselm, called "the founder of Scholasticism" and the greatest scholar between Augustine and Aquinas, is consecrated archbishop of Canterbury. December 5, 1484: Pope Innocent VIII issues a bull giving two German inquisitors jurisdiction over prosecuting witchcraft. Though the pope didn't intend for it to be anything major, the Germans used it to promote their book, Hammer of Witches. Its publication led to the fervent, but often exaggerated witch hunts of the next two centuries. December 6, 345 (traditional date): Don't let the little kids find out, they might misunderstand, but St. Nicholas, bishop of Myra, one of the most popular saints in the Greek and Latin churches—and believed by many to be the original Santa Claus — dies on this date. December 7, 521: Irish monk Columba, missionary to Scotland and founder of Iona and many other monastic communities, is born in Donegal. December 8, 1934: American missionaries John and Betty Stam are beheaded by Chinese communists. The couple had met while attending Moody Bible Institute and married just the year before their deaths. Publication of their biography prompted hundreds to volunteer for missionary service. I completed the 200km Ride to Conquer Cancer. I am very grateful to all of you who supported me in this effort, whether financially, by encouragement, or by helping to sort out the details. Thank you!!! All of you. Be warned however! I've already signed up for next year's ride. After more than 30 years of reading the Scriptures, observing the world around me, scouring the media, and contemplating it all with friends and strangers alike over numerous cups of coffee -- I'm hoping I've learned enough to make comment on a few things you may find of interest. In Germany they came first for the Communists, but I didn't speak up because I wasn't a Communist. Then they came for the Jews, but I didn't speak up because I wasn't a Jew. Then they came for the trade unionists, and I didn't speak up because I wasn't a trade unionist. Then they came for the Catholics and I didn't speak up because I was a Protestant. Then they came for me, and by that time there was no one left to speak up. - Martin Niemoeller speaking to the Confessing Church in Frankfurt, Jan. 6, 1946.